I’ve released some updates to the SalesLogix Mobile Developer Toolkit. This new release adds some fixes and a few new features. 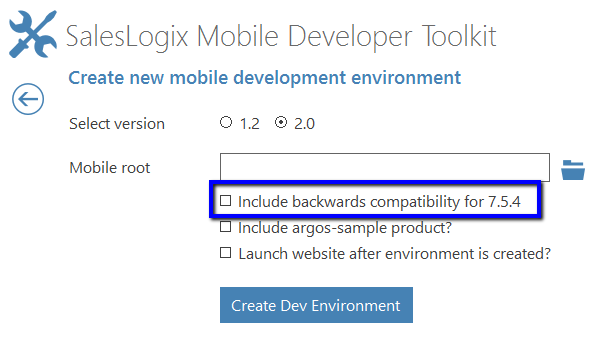 There is now an option for including the mobile 2.0 backwards compatibility module for SalesLogix 7.5.4. This means, if you’re on SalesLogix 7.5.4, you can use Mobile 2.0 instead of Mobile 1.2. If you’re using SLX Mobile at all, going with Mobile 2.0 is by far the best route. This option will add the backwards compatibility module to your development environment for you. 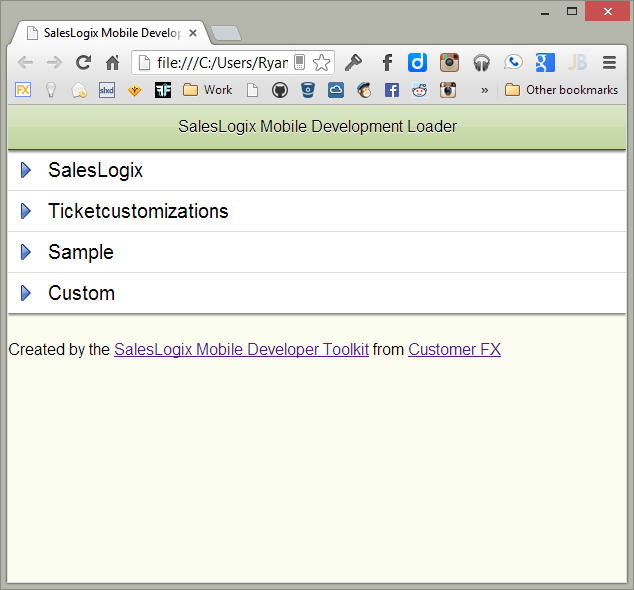 The SalesLogix Mobile Developer Toolkit now creates an index.html in the root of your development environment. Any new customization products that you create get added to this index file automatically. Now, you can navigate to the root of your development environment and see a list of all customization products in your development website. Obviously, you can click on any of these customization products and open the mobile website with that customization product loaded. Go back to the root and load some new set of customizations by clicking on a different customization product. If you already have the toolkit installed, simply opening it up will cause it to automatically upgrade to this new version. If you’ve not yet tried out the toolkit, download it and take it for a spin. Also, be sure to check out my new developer series on SalesLogix Mobile. See the series index for a list of articles to get started. Thanks for all the work you put into this, Ryan!